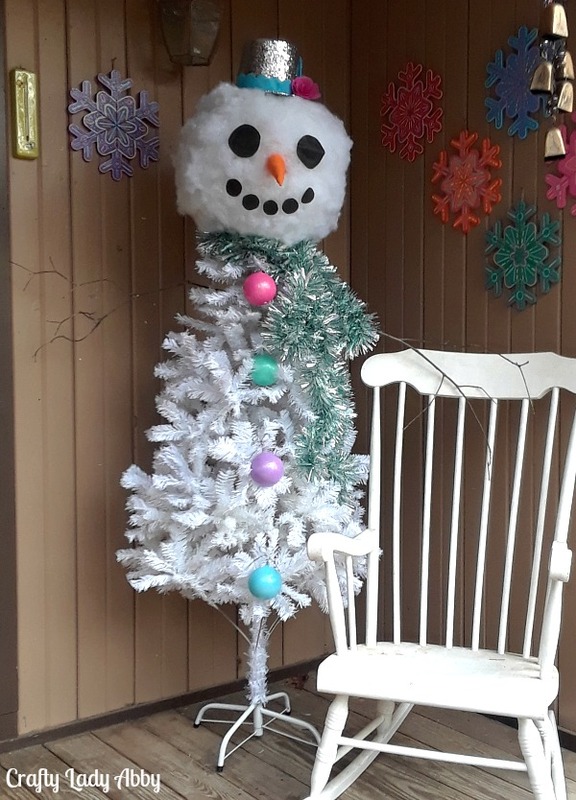 This whimsical snowman Christmas tree is my 2nd tree this year. I think I've caught the Jennifer Perkins kitschmas bug, which is a good thing. 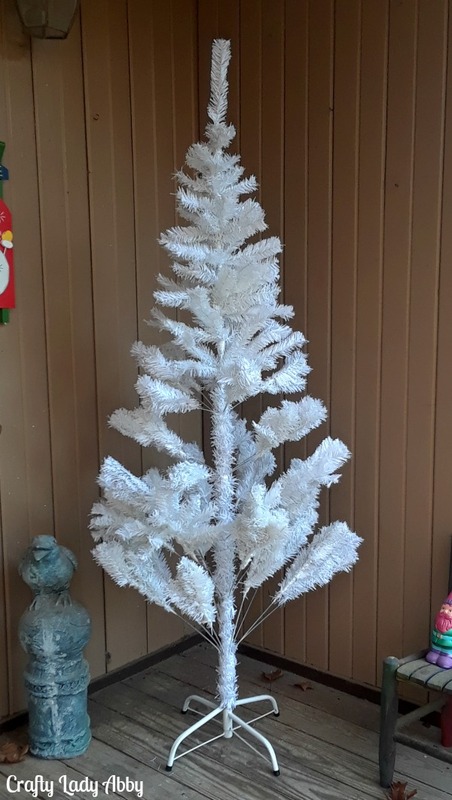 Way back in October I bought this white tree off Ebay. Then, a few weeks later, I won a fancy tuxedo black tree from Treetopia, as seen in my Black and Metallic Vintage Inspired Christmas Tree Skirt tutorial. I was stumped on what to do with this white tree. 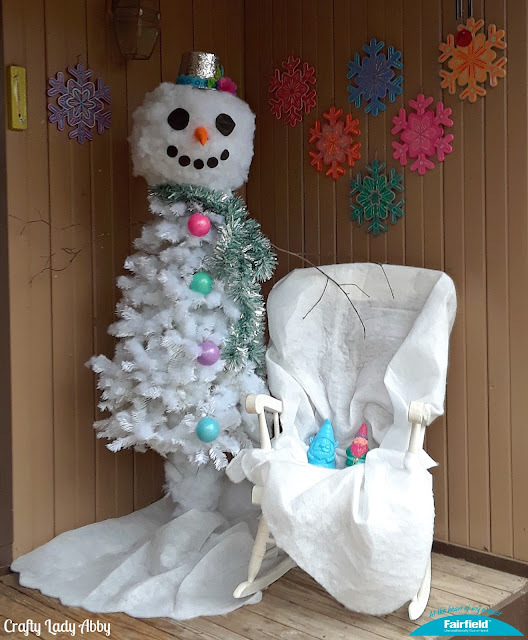 I stumbled upon snowman trees while perusing Pinterest, which is how this guy came to be. You can customize it however you want. 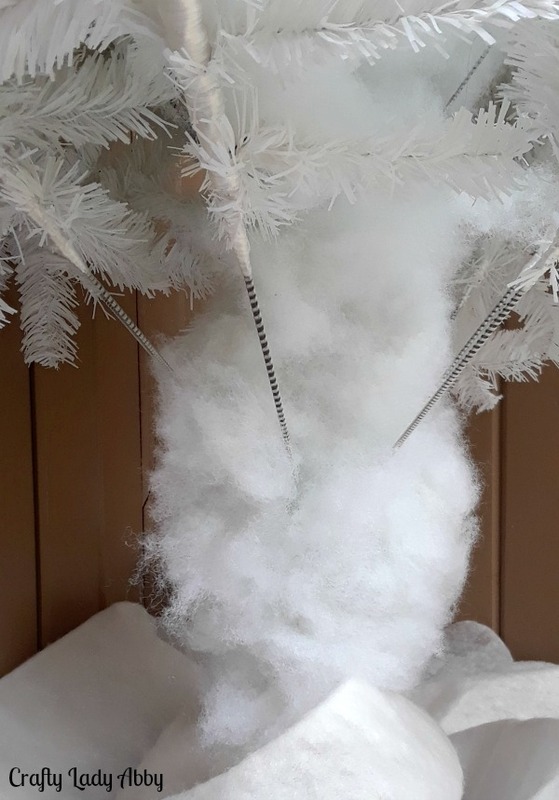 This is a long tutorial, as there are lots of elements that go into making my snowman tree. Fairfield World, DecoArt and Adhesive Technologies provided products for this project. Fairfield World paid me to create this project. All opinions, photos, and instructions are my own. 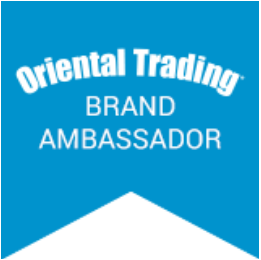 I use Amazon and Share A Sale affiliate links. Any purchases made using these links will result in the companies paying me a small commission. 1) Lay the silicone craft mat on your work surface. 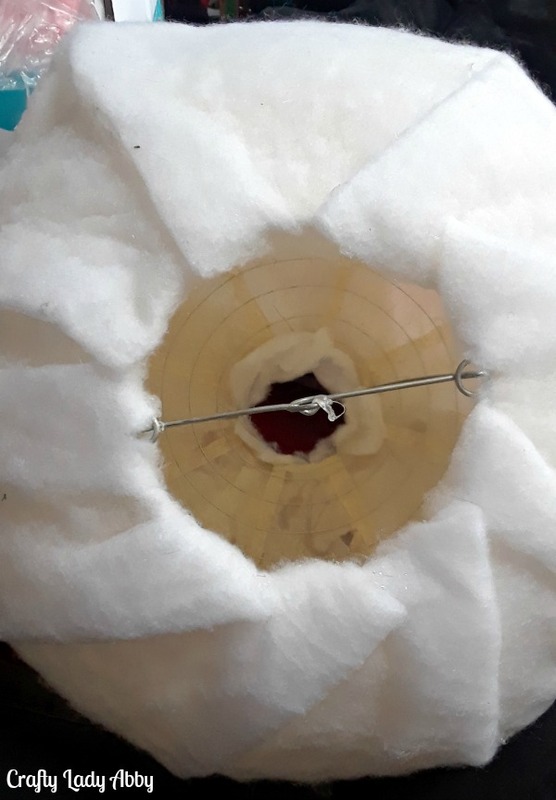 Plug in the glue gun and set it to high temperature. Add a hot glue stick if needed. Loosely measure a piece of batting large enough to cover the lantern. It's better to be too big than too small. 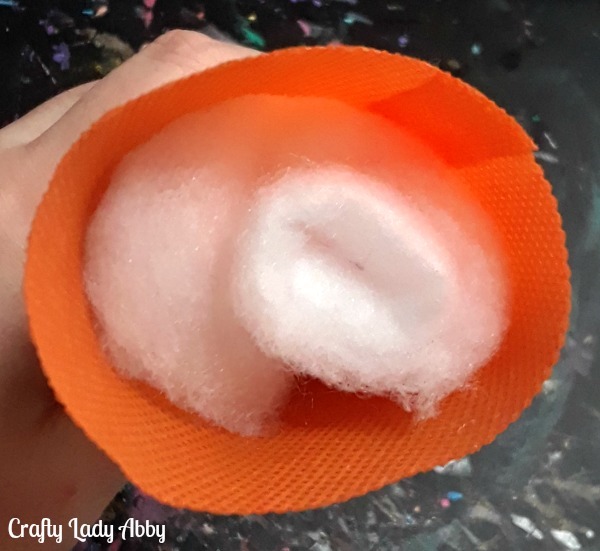 Apply a line of hot glue from the top to the bottom of the paper lantern. Line up one short side of the batting rectangle onto the hot glue line and press in place. Working in sections, zig zag hot glue lines down the center of the lantern, smoothing the batting into place. When you get back around to the beginning, overlap the short batting edges and hot glue in place. Pleat and hot glue the top and bottom, turning the edges into the lantern openings. Cut away any excess batting. This batting layer doesn't need to be perfectly smooth, as the Poly-Fil stuffing will disguise any lumps. 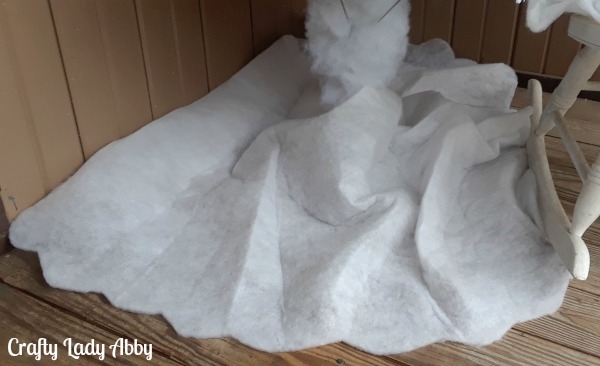 2) Working in sections, apply a swirl of hot glue and an opaque layer of Poly-Fil stuffing. I kept my layer even and thin, but thick enough to cover the batting and glue. Cover the batting layer with glued stuffing. I got the most hot glue burns on this step, so be careful! Leave an open space for the carrot nose. 3) Switch the hot glue gun to low temperature. 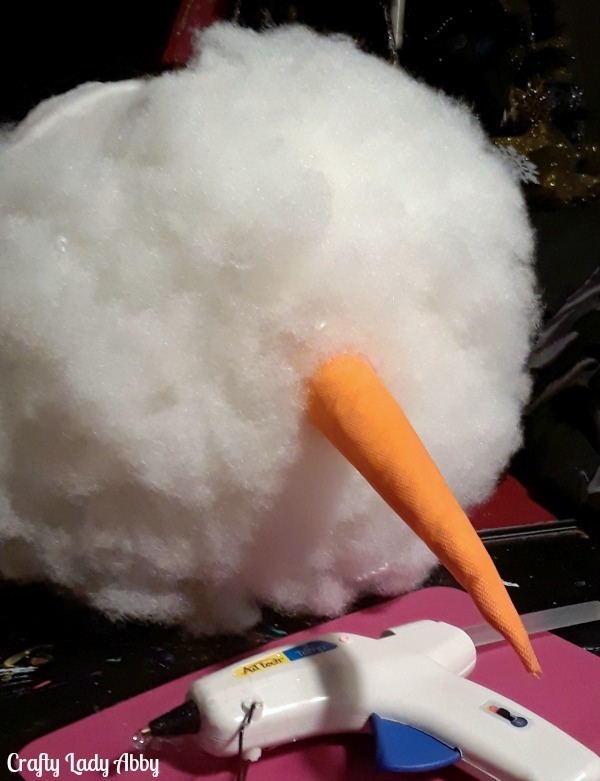 To create the carrot nose, I rolled the Olyfun in Orange Crush into a cone to decide the length and diameter, cutting out a long triangle. Overlap the two long sides, using a line of hot glue to secure the them. Roll up batting scraps to fit inside the carrot nose. 4) Cut slits around the circle opening. 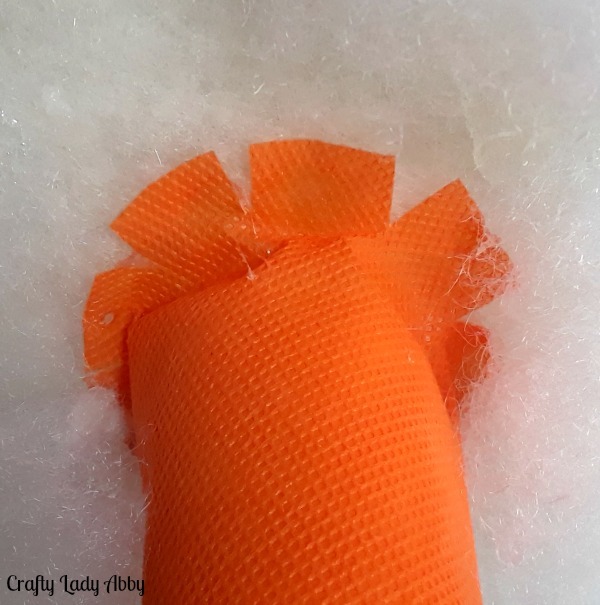 Add a little hot glue to the bottom of the carrot. Press the carrot onto the opening left on the head, with the slits outward. Add hot glue to the slits and press them down. 5) Add more hot glue on top of the slits and surrounding area. Add more PolyFil to finish filling in the batting. 6) From Jet Black OlyFun, cut out two circles for the eyes. Cut out 5 smaller circles for the mouth. Hot glue in place. 7) Set up the white Christmas tree and arrange the branches for the fullest appearance possible. Leave the very top branches pointed upwards. 8) Gently push the snowman head onto the tree top, arranging the branches to fit inside. The head will be front heavy, but try to keep it upright. 1) Cut a rectangle of Sky Blue OlyFun, long enough to fit around the hat by 2" tall. Fold the OlyFun strip into 4ths. Scallop cut one long edge. Unfold the strip. Working in sections, add a bead of hot glue to the bottom edge of the hat and press the strip into place. I off set where the strip started and finished, so that the edges were covered by the flowers and decorations. 2) For the feathers, I cut long leaf shapes from Sky Blue OlyFun. Then, cut slits 1/8" apart at an angle pointed towards the center, on each side of the leaf shape. Leave a center strip uncut. 3) For the leaves, I cut long leaf shapes from Kiwi OlyFun in various sizes. 4) To make the flowers and buds, I used my OlyFun Desert Flowers and Succulents Headband Tutorial, in Bubble Gum and Orchid. 5) To glue the arrangement, I started with the big pink flower, gluing it towards the front. Then, I glued both feathers behind the pink flower, pointed at different angles. 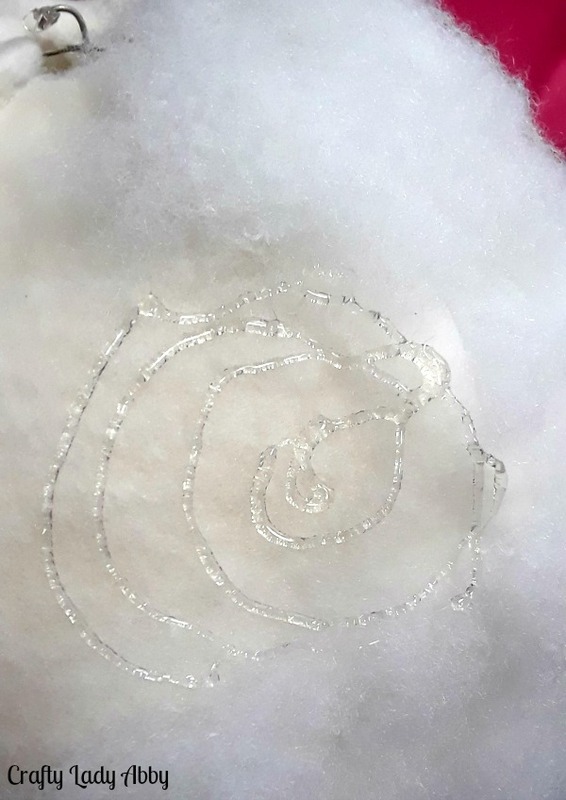 If you only apply glue to the feather middle, then the slit edges will keep their loose texture. I glued the purple flower pointed opposite the pink flower, butting them up together for good coverage. I glued the buds behind the pink flower petals. I glued green leaves, spacing them around the existing elements. 6) For more dimension and detail, I used paints and a paint brush. I used Ocean Blue acrylic paint to add circles and dots to the Sky Blue strip. I used Bluegrass Green to add lines to the leaves. I used Purple Passion glitter on the purple buds and flower. I used Crystal Craft Twinkles to add sparkle to the flowers, buds, feathers, and leaves. 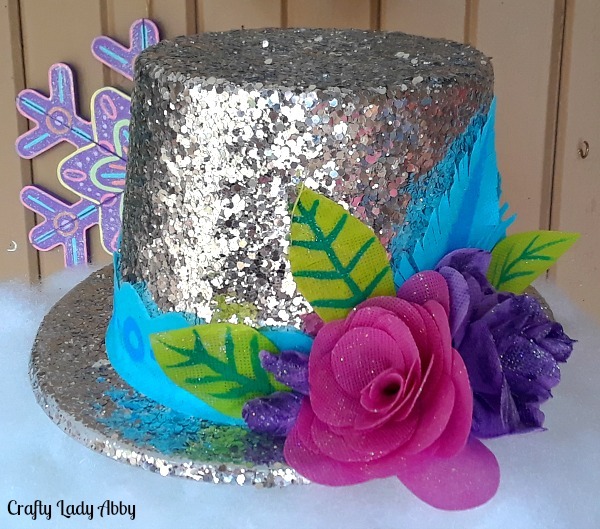 I felt that added a shimmery snow feel to the hat. 7) Place the hat onto the snowman's head. I feel it won't get blown down, but I might use hot glue to secure it later on. As my postman said today, I can reuse the hat for New Year's Eve. He tends to like my whimsical porch decor. 1) Lay a plastic table cloth outside. Place the clear ornaments on top. Lightly spray them with clear plastic primer spray paint. Let them dry fully. 2) Lightly spray the ornaments with flat white spray paint. Let them dry fully. 3) Paint a layer of Titanium White acrylic paint onto the ornaments, to make them fully opaque. 4) Using Carousel Pink, Wild Orchid, Sea Breeze, Indian Turquoise, paint the ornaments different colors. Let the 1st coat dry. Give them a 2nd coat for better color opacity. 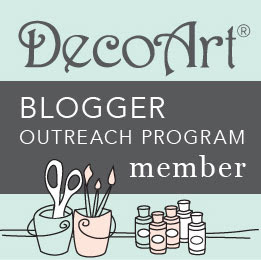 5) On the plate, mix even parts DecoArt Craft Twinkles in Crystal and DecoArt Glamour Dust Paint in Ice Crystal. 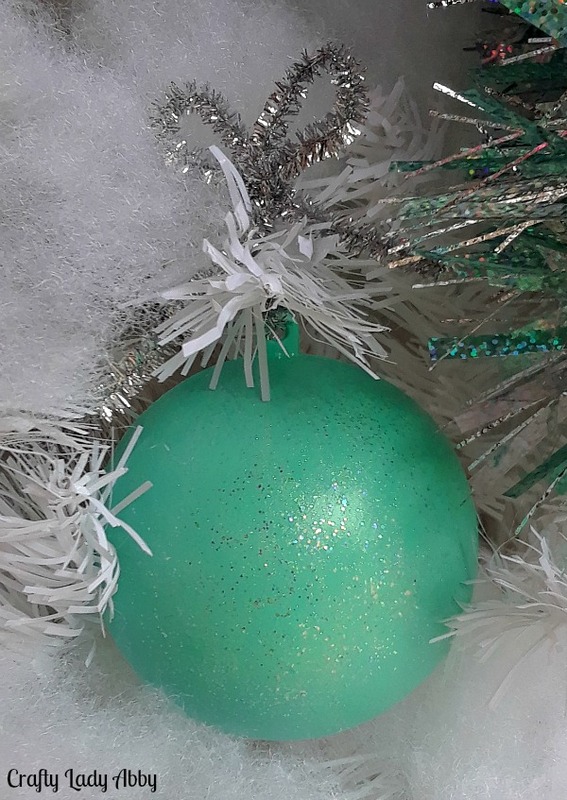 Paint the ornaments with the glitter paint mixture, in 3 layers, letting each layer dry in between coats. Let them dry fully. 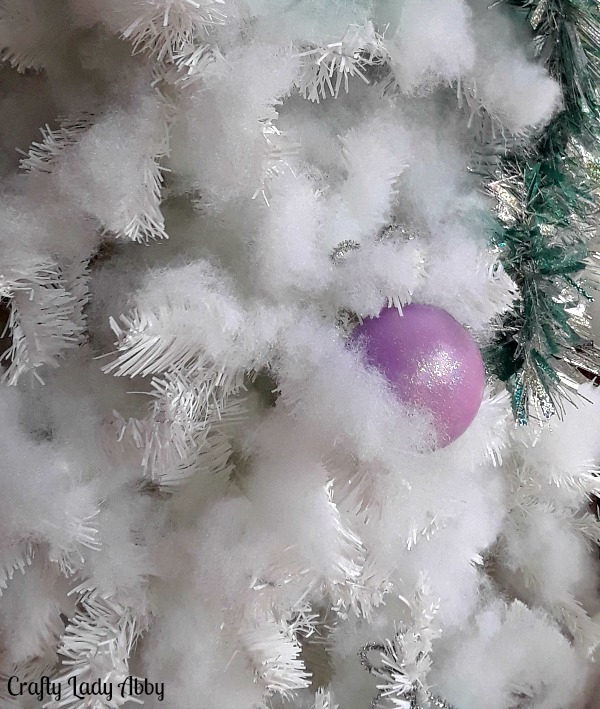 6) Use white or silver chenille stems to twist the ornaments onto the tree. I formed bow shapes by twisting together even loops. 1) Loop on the garland below the snowman head, like it's a scarf. I did a double loop, to form a bow shape. 2) Find branches that look like arms, but aren't heavy. Use zip ties to secure them to the tree pole and branches. They should jut out, and not sag. 1) Use Poly-Fil stuffing to fill in big gaps, disguise the pole and lightly dust the branches. This will take a while, as you'll keep finding gapes and branches in need of snow. You still want to see some of the tree branches. 2) Use Poly-Fil batting to create a basic tree skirt. I scalloped the edges and bunched up sections for a snow drift feel. I used leftover batting to cover the adjacent rocking chair. I cleaned up my gnomes and set them in the rocking chair as if they are elves. 3) I went back in with more Poly-Fil stuffing to cover the pole bottom. I stopped here, as it's already a project with a lot of steps. 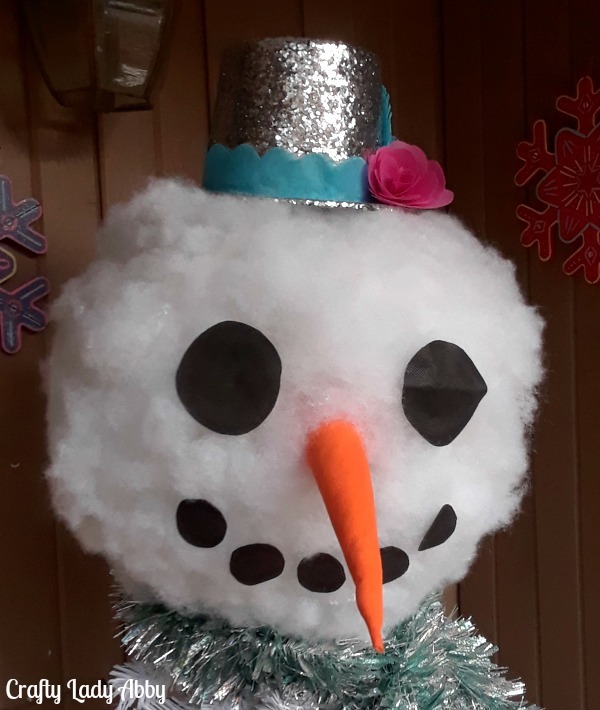 Some other ideas were defining the snowman shape with white tulle, adding a snowflake dress using Snow White OlyFun, adding icicle ornaments, adding a broom...etc. It's already pretty fancy, but like any Christmas tree, it can always be more over the top. It's hard to know when to stop. Whatever you're making, have fun with it. Happy Makery!